For the first time, Nigerian television is centred on young business people and how they go through the challenges of entrepreneurship and business. The top 16 contestants come from across the country and their businesses are as diverse as they are. However, they have one thing in common, they are all out to win the top prize of 5 million Naira, a brand new car and lasting business support from some of Nigeria’s top business moguls. The youngest contestant is Jubril Juma who at 22 wants to start up a road traffic monitoring system to help you make better route decisions as you commute, while the oldest is 35-year-old Williams Oti from Rivers state who has a plan to start-up a talent school and help young people turn their talents into skill and business. Also on the show, meet Izizi Okpala who is interested in making your gadgets look beautiful and Tunji Akande who’s jewelry pieces will blow you away. As a matter of fact, you’ll find some of his pieces on the necks, wrists and ankles of several of the contestants, including Tobechi Nneji who is an On Air personality with 92.5 Enugu’s Dream FM. She has the plan to start up a trade and PR fair in South Eastern Nigeria. Every week, watch how the contestants work their way through tasks, slug it out in the boardroom and sometimes, turn on their ‘best friends’ in the race to win. Get a favourite housemate…support your favourite idea…learn the intricacies of entrepreneurship. 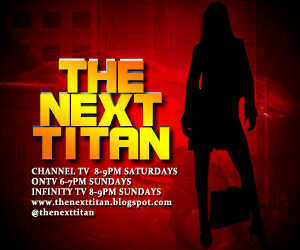 Visit www.thenexttitan.blogspot.com , www.thenexttitan.com to read more about the contestant and follow @thenexttitan and the tag #TitanNG on twitter for quick information and some behind-the-scene gist from the show and the google hangout with some of the contestants. 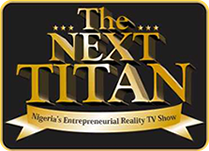 Vote for your favourite contestant via SMS- text ‘Titan’ (space) ‘Contestant’s name’ to 33352. SMS' cost N50 each.